The next title in our colourful "Pens" series for 3- to- 6-year olds, featuring 30 days of short Bible readings brought to life with the help of the Pens characters, and including thoughts, questions and prayers to relate the readings to daily life. Written in four sections, two focusing on the lives of Pens and two on Bible characters, young children will be inspired to learn more of "God and His Word". 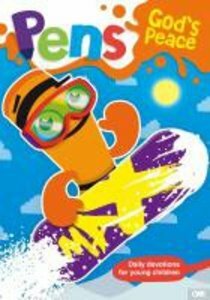 Pens - God's Peace see's Waxy Max on a snowboarding holiday with the other Pens, Marco learns that when we are jealous of other people we can end up doing unkind things to them. In the story of Joseph in Genesis, we read about Joseph's jealous brothers and how God can help us to live in peace with those around us. About "God's Peace (Pens Daily Devotions For Small People Series)"